She is cute and in food dreamland 🙂 I love the way she steadies the pot with her paw, rather like a person would with their hand. Has springtime come to your neck of the woods, Sarah? HAve the winter storms passed? Yes, Naomi, spring is definitely in the air. I’ve even sat outside for lunch a few days running, and gone for walks with my sleeves rolled up and no coat or hat. And a dove was busy in my garden today collecting twigs today for a nest, which is definitely a good sign. Lovely! I think our climates are very similar. We are enjoying sunshine and 60 degrees (F), after a long gray rainy stretch. I think she was oblivious to the camera, transported to another world — a doggy heaven flowing with ice cream. 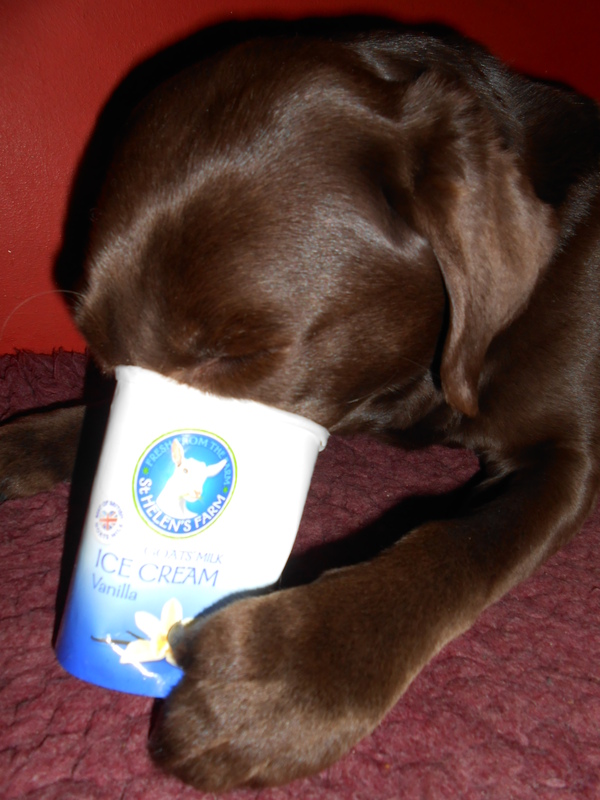 When Darwin first saw a Labrador he postulated that somewhere there would be a long cup filled with ice cream which could only be reached with a long tongue. Six years’ old at the end of this month, although most people think she’s a lot younger. Yes, she looks like a pup in that photo. Very cute.